Possible death-toll up-to three (One Official) after the Calvary caused havoc at a FDC Rally in Rukingiri! 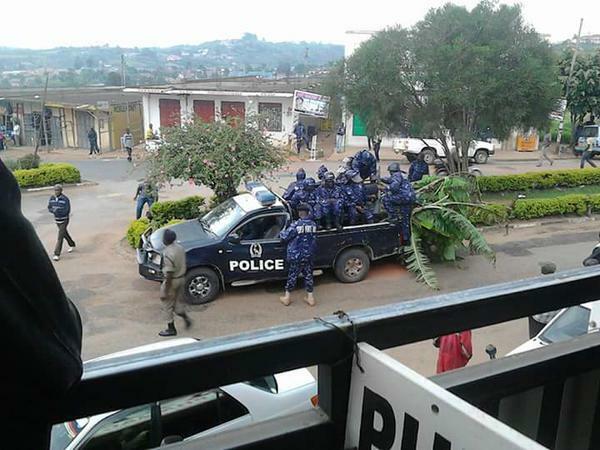 Rukungiri today is a mark, a day where the opposition met the most hostile force of Police in the country. Where the people took the person shot by the Police and went in procession to the Rukungiri Police Station. In total one is officially dead, but there we’re rumored up-to three people died in the skirmishes done by the Police Officers today. One at the stadium and one at the nearest hospital. This should be told as the state enforced violence is now deadly. That the loyal troopers of the IGP Kayihura shoots bullets against civilians who dissent from the state or Presidents view. This because there was a rally hold by Forum for Democratic Change (FDC), by big leaders like Patrick Amuriat Oboi and Dr. Kizza Besigye, Besigye was even tried assassinated as the shot was hit high up by the back window of the white Van. The same people who tried to hold the rally at Rukungiri Stadium and also reacted with the shooting of one citizens in the rally, the same crowd walked to the house of the police officer who killed the protester. 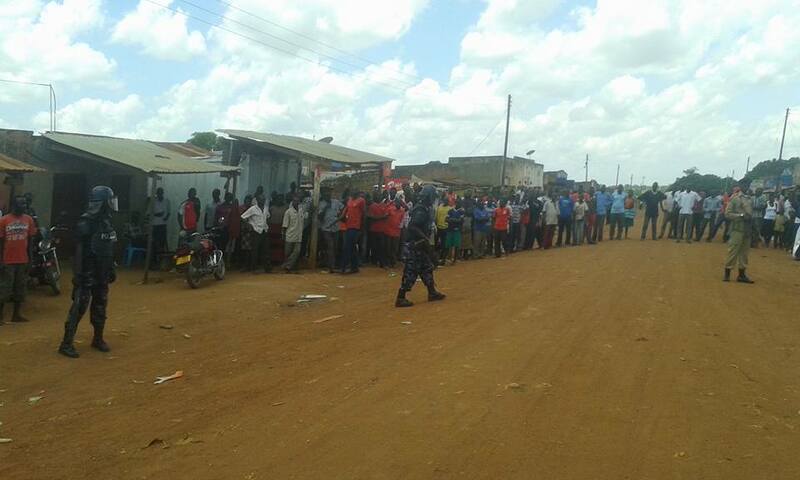 So the public in Rukungiri has acted with peaceful means against the aggressor and the intimidation of the Police. They clearly didn’t win this, even if they killed someone innocent in Rukungiri today. The stadium the FDC party had even paid the Rukungiri Municipal County rent for a 100,000 shillings to use. Still, the Police blocked it and the havoc it created, as the FDC had even written letter about the commitment for Presidential Campaigning for the FDC Party and the rally for Amuriat Oboi. Clearly, this was now deemed illegal by the authorities and therefore, the violence occurred on the premises and in town. This is not the first time people has died because of the Police Officers defending the ruling regime and the orders of central-government. 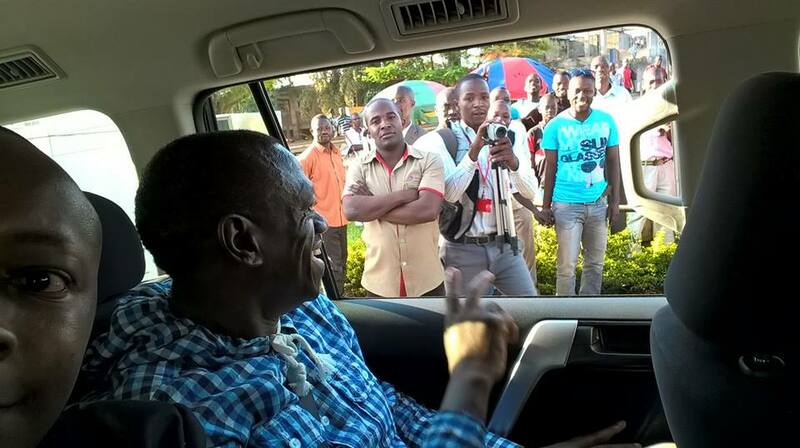 It is happening again and Besigye gets into trouble, nearly assassinated as he drove through Rukungiri. There we’re continuing lots of bullets and shooting. That just the three reported dead says a lot. It could have been more, as the Police Officers has been rumored told each other to not use all bullets. Since, the public was able to overcome them. So they could enter the barricaded Stadium. Still, the tear-gas and violence stopped the peaceful gathering in the town. All of this has come as the Police has banned rallies from Members of Parliament having consultation meetings outside their constituencies, even banning joint-rallies as well. Similar to this one, even if the FDC had all things covered before the new police order made on the 16th October. This proves the law are clearly only to follow for FDC and not for NRM. As the NRM can consult and have meetings wherever, without any problems from the law. We can now see the devilish ways of the authorities, that they have no trouble again to kill. Even try to shoot the car of the leaders. So to silence the FDC totally and their local hero, Besigye. It shows something about the leadership. This is not acceptable, this proves the draconian dictatorship the republic has, as even a simple rally that was prepared for and had public uprising to show-up got violent and intimidation from the Police. They are not interested giving the opposition party and space. Therefore, the violence and killings had to occur. It is insane, but shows the lacking of accountability of the state and their lack of democratic values. Neither the checks and balances, as the Police brutality is accepted by the Central Leadership, as this is done to silence the citizens. Since the state has no trouble to end a life, if the make the ends for the Presidency to continue. This is the state of affairs. It is not right, it is wrong. There isn’t anything proven or anything good come out of today. Other than a little prove of people power, but still innocent people died. Who just fought for their cause and for what they saw just. They didn’t show up to die, they showed up for the Constitution and justice. Instead they got legal impunity and police brutality that ended up in death. This injustice should not be accepted, life should be valued, not just the lifestyle and power of the President. He is not only one borrowing time and living in Uganda, there is the 41 millions who deserves justice and not possible injustice, because the orders from above, says so! Enough, it should be enough! To many lives has been lost. 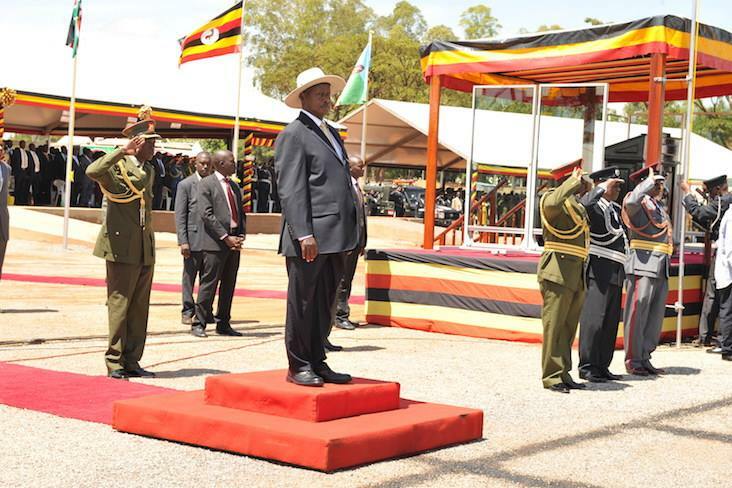 Just so Museveni can rule, the tally should be far to high already. Peace. Déjà Vu’: The Kampala Metropolitan Police doesn’t have common sense when it comes to Besigye! It’s is a déjà vu’ for Dr. Kizza Besigye today as he must have felt it, yet again entering Makindye Court to answer yet another case in-front of another judge; The Judge must really like Posho, because the charge was soft and gooey. Even ACP Polly Namaye claimed the infamous law Public Order Management Act on the detaining and stopping Besigye from attending the Tuesday Prayer at Najjankumbi Headquarters in Kampala on the 4th April 2016. As the Police at that time called it a planned procession through Metropolitan Kampala as he was driving from Kasangati through the town. That day he was planning to cross Mulago toward the Central Kampala, but as Police Commanders under orders of Kampala Metropolitan Commander Andrew Felix Kaweesi. Then his car was whisked away as he was taken to Old Kiira Road Police Station. This was as he had disobeyed Police Orders at a Roundabout towards Kalerwe not far from Mulago. So the Police had already decided to detain him! Now today he entered the Makindye Court together with Lord Mayor Erias Lukwago at his side, to address the court of the unlawful behavior and disobeying police orders in April 2016. Apparently the earlier trial dates are showing that the Government defense of the case was manufactured and wasn’t clear. As the State-Witness on the 22nd May when addressing the court was even contradicting himself and wasn’t really saying anything considerate about the case. For instance at one second he was a higher level officer in the Army before becoming Police, later he countered that statement with saying he never we’re in the Army. If that is the truth than he had a hard time becoming an officer in the army, when he never was there! Therefore the evidence of the crime we’re properly dismissed at Makindye on the 25th July 2016. This proves that the Police Force and Government have wasted lots of time creating issues instead of actually governing. So the continued aggression from the state came quickly as the word of the dismissal and public walked and greeted Besigye in the Central of Kampala. This was not accepted by the government and Police. The Police still under Andrew Felix Kaweesi, had to silence the brief greeting the public. As the “procession” made-up by random people and supporters shows the popularity of the FDC leader. Therefore today’s activity from the Metropolitan Police must feel back to the normal as he quickly from leaving the Makindye Court we’re taken to Jinja Road Police Station; while he car we’re towed away from the place in town he we’re picked-up by the Police. So the reality is that the Police is creating a problem; instead of erasing problems. They claimed his car was shoddy and a DMC or a Defect Automobile (Dangerous Mechanical Condition). So the White Toyota Land Cruiser been the criminal passing town and apparently the driver or driven by Besigye. So they couldn’t charge him with procession, I am sure the Police Officer wasn’t sure how to write that; as the Police Officers have written that wrong before. At the Jinja Road Police Station the detained politician and arch-nemesis of Museveni, Besigye we’re spending time with loyal allies in Lord Mayor Lukwago, Wafula Oguttu, Hon Amuriat, Hon. Geoffrey Ekanya and Ingrid Turinawe. As he we’re also collecting his statement on disobeying police orders, while his car we’re lucky to be claimed to be a DMC, while the footage on NBS and NTV of the matter shows the “damage” is fiction from the Police Officers to find reasons to detain him again and create new possible trial dates to stop him from attending and questioning the rule of law in the Nation. So the phony and laughable perfect IGP Kayihura has yet another question about the man so-called fighting him. As he under his leadership tormenting Besigye another day at one of his Police Stations in the Central Uganda; one of the Police Stations Besigye knows well. Surely one of the places he should have wall where he could use chalk to imprint how many times he has been detained there. So IGP Kayihura must be proud of Commander Kaweesi for yet another time finding a solution to silence Besigye, with the charge of DMC. 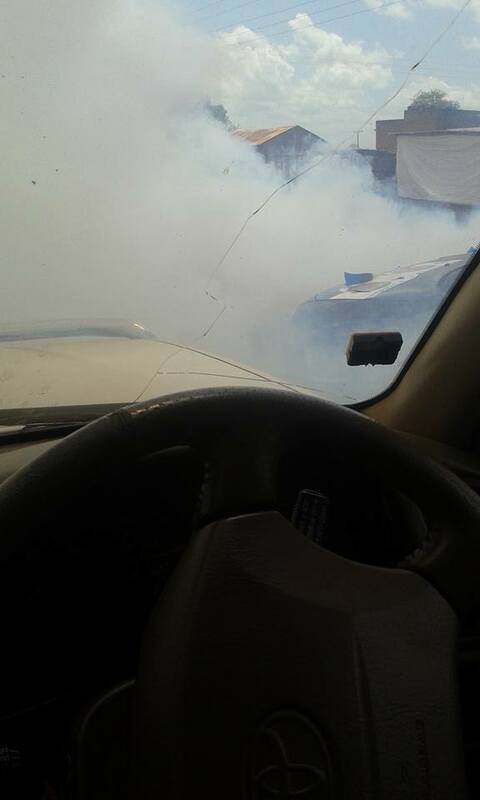 The car that the Police have broken before in 2016 to tear-gas the ones sitting in the car! Did you forget that, yes you did; and at one point Kayihura even promised a new car to Besigye, like that would happen? Well, let’s be clear, this a phony charge, in the levels of impunity of the Calvary, the Kifeesi Police who has respect and want’s to silence the opposition with the detention of vocal opposition and men of defiance against the status quo of those who are dropping funds after NRM Cronies in scam-bailouts. That is the ones that are detained today and the conflict of justice for all is not there; it is only justice for elite and the men kissing Mzee’s ring. The rest can end-up behind bars, beaten by the police or shedding tears after shooting at the public with teargas. This will continue as the NRM-Regime cannot help them, they are on sail-boat at the middle of sea, far from land without any wind and trying to find oars to row into land; but they are hidden behind deck and the Mzee doesn’t seem to know because his vision doesn’t say so. Therefore the men who are lost at sea are waiting for accurate statement and direction to the oars while the problem of no wind let them left at sea instead of getting into shade at the harbor. Peace. Earlier today in Padre, Acholi Sub-Region, the UPF tear-gassed the venue where Dr. Kizza Besigye had the preliminary election rally. There been reports of teargas and beating from the Police after the planned rally for the Dr. Kizza Besigye was supposed to happen today in Pader in Northern Uganda. It was reported that DPC Amuriat that took the microphone from the venue of the rally and after that the beatings and teargas starting to appear. “Dr. 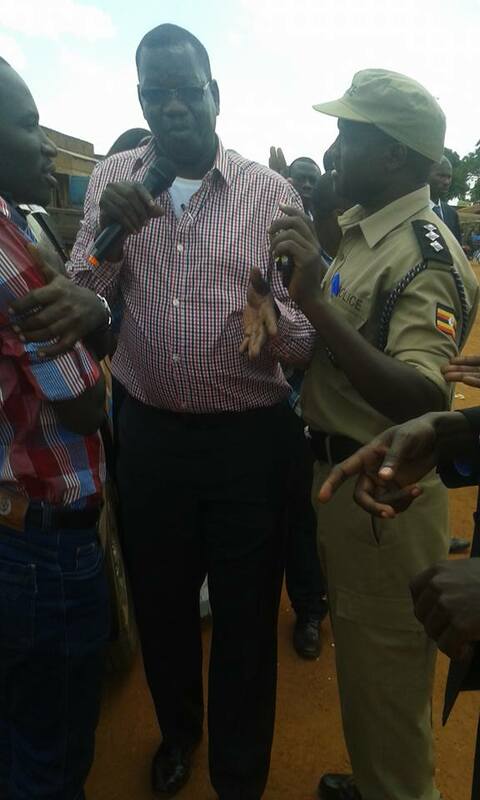 Col. Kizza Besigye has been sprayed with poisonous pepper spray in Pader. Some of his supporter have been beaten, arrested and forced to leave the place where he was supposed to organize a rally for his presidential bid”.